Late last year, while looking for interesting new species of Ts to possibly add to my collection, I encountered P. cancerides (Hispaniola Giant or Haitian Brown) slings on several sites. A couple of the descriptions I read didn’t make them sound particularly interesting, with cancerides being described as good eaters, but fast and skittish tarantulas that mature into large 7+ inch brown females or purplish male adults. Still, the slings were gorgeous, sporting a gorgeous blue sheen, and the fast growth rate was a plus. After weeks of reading personal accounts from those who kept this species, and finding them all to be enthusiastically positive about these animals, I decided to pick a couple slings up from Jamie’s Tarantulas. P. cancerides has quickly become one of my favorites. My juveniles have a vicious feeding response, stalking their prey with a fast, no-nonsense approach that I’ve only seen in my female L. parahybana. My large P. cancerides will literally leap at prey at an awesome speed. However, as described, they are more skittish than aggressive, choosing to flee into their dens rather than stand their grown or hair kick when their enclosures are opened. I’ll be interested to see how their temperaments change as they mature. Speaking of dens, both of my juveniles are ambitious burrowers, constructing huge underground caves for their dens. However, unlike some of my other burrowing species, they spend much of their time standing boldly out on the surface for easy viewing. No matter time of day, they are usually right out in the open, ready for another meal. As for the rate of growth, my two larger specimens have only molted once in my care. However, the amount of size gained between molts was nothing sort of amazing. My slings started off at a thin 1.5 inches, but grew to an impressive and robust 2.25″ after molting (see photos). More than just the length was the thickness of the spiders; they went from looking like little bluish garden spiders to hairy mini Ts. Both of my cancerides are in pre-molt again, and I can’t wait to see how much they grow this time around. 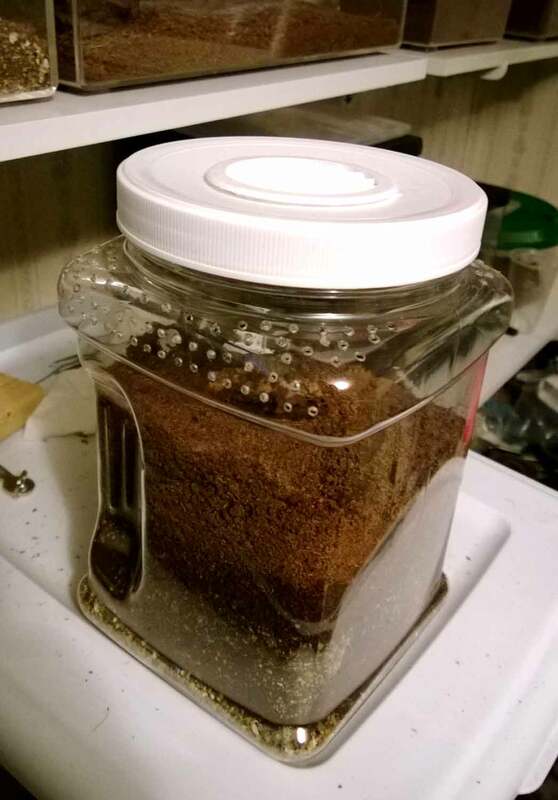 Their care has proven to be quite simple: I keep both of mine in plastic jars measuring 4.5 L x 4.5 W x 7″ H filled to a couple inches from the top with a mixture of coco fiber and sphagnum peat moss (with a layer of vermiculite at the bottom to retain moisture). This gives them plenty of space for burrowing, and the layer of vermiculite at the bottom allows for better moisture retention and a humidity gradient. The top of the substrate is mostly dry, although I overflow the water bowl on one side; the bottom of the substrate is damp. I do not mist, and instead pour water in a corner and allow it to percolate down to the lower levels. The enclosure is well-ventilated with a round 2″ vent in the top and strategically place air holes in the sides to supply cross ventilation. The temperature is around 70 degrees at night with a high of about 78 degrees in the day. These two are fed medium crickets or roaches twice a week. Custom P. cancerides enclosure made from plastic cereal canister. I recently picked up a third P. cancerides, a 1″ sling from Net-Bug, in hopes of increasing my chances of procuring a female. If my current trio turn out to be all males, I will look forward to buying more slings and growing some more. This is definitely a species I’m interested in breeding in the future. 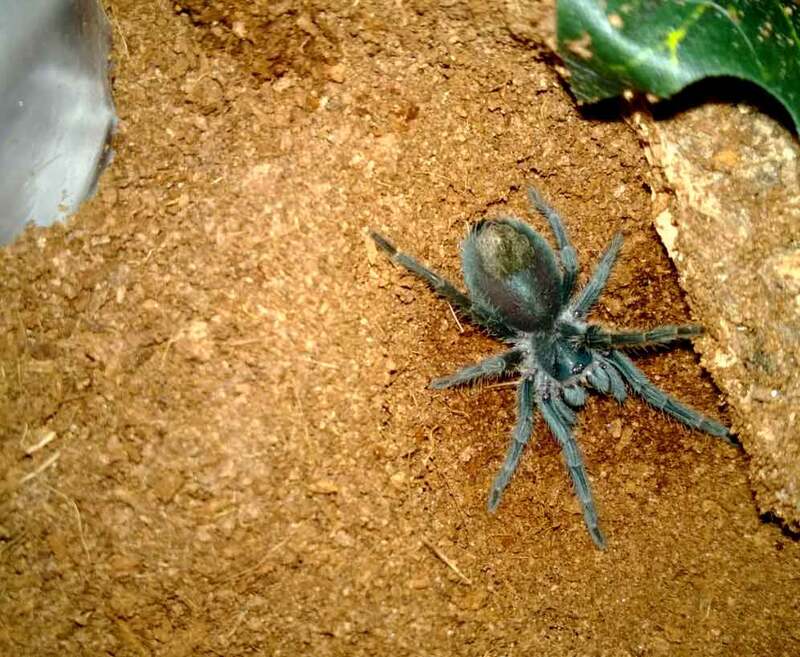 For someone with some T keeping experience, P. cancerides is a beautiful, fast growing, hardy tarantula that would make a perfect addition to any collection. Ahh, yes…you’re right to be more intimidated by the Poecilotheria subfusca. Again, just show it a lot of respect and always keep in mind just how fast member of this genus can move. If you need help with anything, please don’t hesitate to ask! Well, congrats on your first poecilotheria! This genus is absolutely gorgeous and one of my favorites. When I got my first (a 3″ P. vitatta), I treated that critter like she was a radio active monster. The word “cautious” just didn’t cover how careful I was being with her. With time, however, I became more comfortable (no complacent, though!) with the behaviors and movements, and interacting with them no longer causes stress. I’ve found with pokies, one of the tricks is to keep your hands out of their enclosures (always use tongs) and make sure that you’re never blocking their escape route. They would much rather bolt and hide than confront, When I perform maintenance on mine, I do it on a clear table, and I often leave the top off of my enclosure so that if one tries to bolt, it has plenty of places to go besides onto my hand. 🙂 By doing it on the table, if it were to get out, I’d have more room to just cup it when it stopped. The thing is, they have such great camouflage, that if you tap the cage before opening it, they will usually flatten out and try to hide. HOWEVER, the slightest disturbance can pull them out of this mode and send them scurrying around their enclosure. As long as you keep that in mind and don’t get lulled into a false sense of security when they flatten, you’ll be fine. As for the P. cancerides, they are just such great eaters, and the size gained between molts is AMAZING. You’ll find yourself rehousing yours quite a bit. 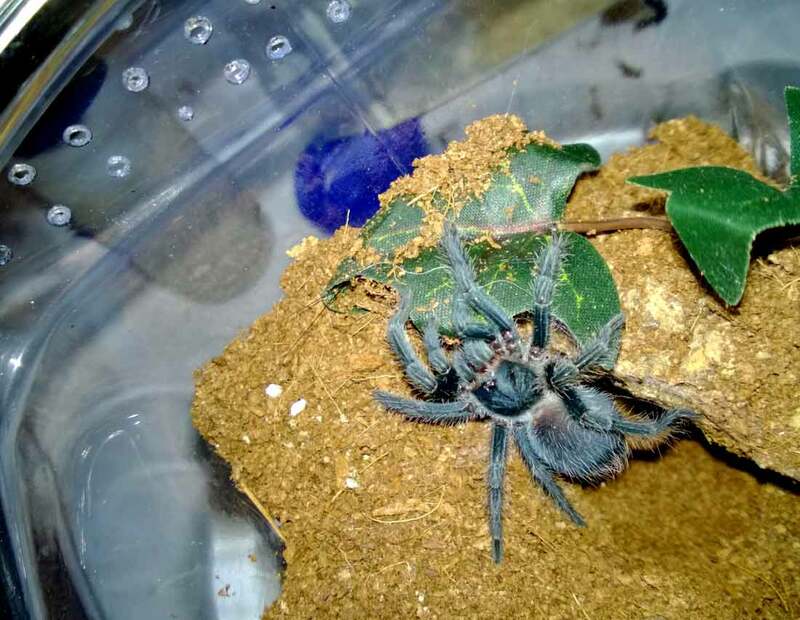 I actually take all of my cancerides when they are about 2 inches and put them in much larger enclosures than I normally would for spiders that size. My first cancerides I purchased from Jamie’s, and they outgrew the sling enclosure after one molt. I moved them into the juvenile enclosure, and they outgrew that in two molts. It was insane, but so cool! New reptile shop opened recently on the south side of town, and the owner is a member of the Colorado Arachnid club on FB. Posted what was for sale, and as this one has been on my “to-get list” for awhile, figured it was time. After reading your post here, I do have to say that this one will have a lot to live up to. My TV buddy the OBT has been the most interesting of my group to date, and I look forward to this one. Oh no! Man, I’m so sorry to hear that. I’ve had to do the “sniff test” before as well; not fun. Let me know how it goes; hopefully, it doesn’t disappoint. I currently keep seven species of Phormictopus, and I love them. Great eaters, good growth rates, huge size jumps between molts, and sweet color changes.